More on the Chief Raxxess Desk or Musical Keyboard Workstation (Ebony) ETUDE below. 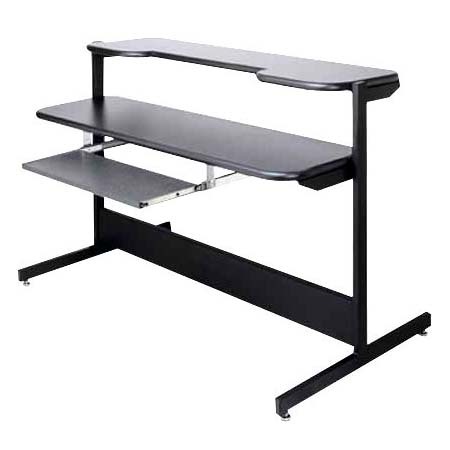 A sleek workstation in Ebony Fleck laminate and black powder coated steel makes for an efficient workspace. Includes slide out keyboard tray and adjustable leveling feet. The Chief Raxxess Etude is perfect as a desk or as a studio keyboard workstation. The frame is constructed of 1-inch by 2-inch tubular steel side supports of 16-gauge material. The fabricated bottom cross member is 1-1/2" by 6". 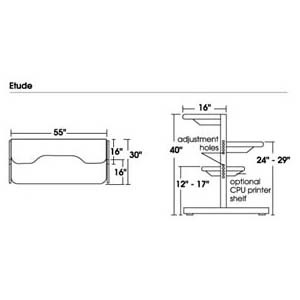 Both the keyboard shelf and the optional printer/CPU shelf (not pictured) that mounts to the lower portion of the frame are adjustable in 1 inch increments to 5 inches. They each measure a generous 55" wide and 16" deep. The 55" width will support an 88-note keyboard while the contoured upper shelf can easily accommodate audio and video monitor.